Edinburgh is a large community facing prison receiving offenders predominantly from courts in Edinburgh, the Lothians and Borders, but also offenders from the Fife area. The current design capacity is 870 and we hold on average 900 offenders per day. The prison manages adult male and female offenders for those on remand, short term offenders (serving less than 4 years), long term offenders (serving 4 years or more), life sentence offenders and extended sentence offenders (Order of Life Long Restrictions). Tolbooth 1386 to 1817: The Old Tolbooth was used as a gaol where judicial torture and executions were routinely carried out. A projecting permanent platform was built on its west side, so that the public could view beheadings and hangings. Calton Gaol 1817 to 1924: Calton Jail (Gaol) opened in 1817 amidst some controversy. Lord Cockburn remarked: 'It had been a piece of undoubted bad taste to give so glorious an eminence to a prison.' Jules Verne who visited Edinburgh in 1859 described the gaol as resembling a small-scale version of a medieval town. HM Prison Edinburgh 1924: The building of the prison started around 1914 with the first prisoner being received about 1920 replacing Calton gaol, the current site of St Andrews House on Regent Road Edinburgh. The prison has been completely rebuilt in recent years and was the first prison to complete a refurbishment programme. The opening of Ratho House in January 2009 represented the completion of 10 years of redevelopment work. The oldest building within the grounds of the Prison is Glenesk House which opened in 1998. Family Contact Officer 0131 444 3113 (FCO - The phone is not staffed at all times during the day, but there is an answer machine service so please leave your name and contact details and we will get back to you as soon as possible). · Take the M8 to Hermiston Roundabout. · Take the third turn off and proceed along A8 to Calder Roundabout. · Turn left and follow signs for the City Centre-the prison is on the right after the third roundabout. · Take the A90 to Barnton Roundabout, and then take the Maybury Road A902. · Turn right at the end and proceed towards the Gogar Roundabout. · Join the City Bypass (A720) and take first exit to City Centre. · At Calder Roundabout turn left and follow signs for City Centre-the prison is on the right after the third roundabout. · Take the A1 to the City Bypass (A720). · Join the City Bypass (west) exit to City Centre at Calder Junction. · Turn right and follow signs for the City Centre-the prison is on the right after the third roundabout. · Route Nos A68, A701, A702 and A7 all have access to the City Bypass (A720). · When you reach the City Bypass (A720) continue westwards and exit at the Calder Junction. · Follow signs for the City Centre-the prison is on the right after the third roundabout. There are extensive public parking facilities, which include disabled spaces, for visitors to HMP Edinburgh. On entering from the main road, turn left for the visitors’ main parking. For disabled parking, turn left into the main car park, but then immediate right and the disabled spaces are right outside the visitors centre. Lothian Regional Transport buses (coloured maroon) Nos 3, 25, 33, run from Princes Street through Haymarket and past the Prison. There are bus stops on both sides of the road, within 50 metres of the entrances to the prison. The Prison can be accessed from Edinburgh Park, Haymarket or Waverley Stations. Slateford is the closest local station to the Prison. Contact Scotrail on http://admin.scotrail.co.uk/enquiries for further information. From the station you can access to public transport to reach the prison. 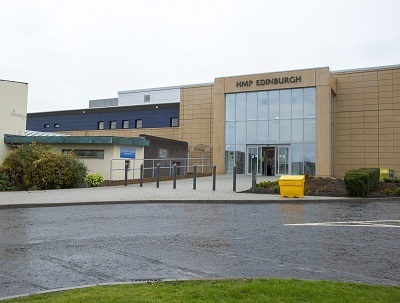 The process at Edinburgh is that all prisoners book their own visits and have the responsibility to inform their visitors of the day and time of the visit. Remand prisoners may have one 30 minute visit daily, except Sundays – no visits are facilitated on this day. Convicted prisoners are entitled to not less than 2 hours in any 28 days period. There is a maximum of 3 adult visitors, this does not include children (under the age of 16). Agents visits can be arranged on 0131 444 3124. All agents are required to give 24hrs notice of any visits or amendments to visit bookings. Information on Legal Visits by video link can be found below. Below is a list of identification requirements, the times of visits session, depending on the location of the offender, facilities and what you can expect coming to the prison. The Visitor Centre at Edinburgh is open 7 days a week, from Mon to Fri 09:00 – 21:00, Sat 09:00 – 16:00 & Sun 12:00 – 16:00. It is a purpose built building managed by Barnardo's in conjunction with the SPS and the Onward Trust. It provides support for families affected by imprisonment visiting a friend or relative. The centre offers a welcoming and supportive environment especially for first time visitors who are unsure of prison procedures. The visitors centre has a café, which sells hot food and drinks; there is an outside and inside play area for children (parent’s responsibility to supervise) and lockers for any belongings not permitted in the establishment. You will need a £1 coin to operate the locker which is refundable. Toilet facilities are available in the centre. Everyone attending the prison for a visit must book in at the visitor centre, at least 30 minutes before the visit session starts. This is to allow sufficient time to process your details and walk the short distance to the visits room. The centre staff will log you in on the system and it’s important this is done first; you can then use the facilities and relax until your visit session is called. You will require your identification and any money you are handing in for the prisoners PPC and up to £10 in cash. You will not be allowed to take in a purse or wallet. If you have a baby with you, you can take essentials such as a change of nappy, baby wipes and baby bottle with milk – no baby food is permitted. The baby items must be left on the FCO’s desk in the visit room, but you can access them when you need to. On entering the prison through the main door you will be required to present your identification to staff. You will then walk through a metal turn-style into a secure waiting area. There will be staff in this area to help and offer guidance. In the waiting area you are able to deposit money in for prisoners PPC. All visitors will be asked to walk through a metal detector and given a rub down search by a member of staff. At times, there may be the SPS Dog Unit operating at the visits – it’s nothing to worry about and you will be given instructions by the staff. If you have any concerns at all – please talk to a member of staff. You will be taken down a short corridor to the visits room where you will be met by the FCO and they will allocate you a seat. Once visitors are seatedthe prisoners will then be brought in. You will be made aware 5 minutes prior to the end of the session. At the end of the session prisoners will leave first and then visitors will be asked to exit. Visits room - There is always a FCO available for anyone wishing to speak to them throughout the visits. Friends of Edinburgh operate a small café, with limited stock, selling tea, coffee, soup, crisps and sweets. There is no café facility on a Saturday and Sunday morning. There are toilet facilities, including disabled toilets and baby changing facilities available as well as a children’s play area, which again is unsupervised and parents responsibilities. Property for convicted and untried offenders may be handed in at the main front desk on the following days and times. You can post in property for offenders, but the offender must have completed the pro forma prior to the items arriving. Mark the parcel for the individual’s attention. To ensure the parcel arrives safely, you can send it recorded delivery (cost incurred at the post office). Cheques will be accepted with the appropriate bank card, made out to the SPS (will take 5 working days to clear). Please note female offenders' property and personal cash can also be handed in on Wednesday evenings prior to their visit session between 18:15–19:00. You can post money into a prisoner for their PPC, however we would strongly recommend either recording/special delivery (costs incurred at the post office) when posting cash or you can post a cheque or postal order (again there is a cost incurred at the post office for the order) in. Both of these should be made payable to the Scottish Prison Service, but please add the offenders details on the back of the order or cheque. to attend the day time session.